Over a year ago, 6sqft shared the news that Staten Island’s abandoned farm colony was set to undergo a massive rehabilitation that included a large senior housing building and a massive public park. And just yesterday, the City Council approved the New York City Economic Development Corporation’s plan to sell 45 of the site’s 96 acres to Staten Island developer Raymond Masucci for $1, according to the Times. Mr. Masucci will pour $91 million into the project, dubbed Landmark Colony, rehabilitating five crumbling Dutch Revival-style structures, tearing down five more but saving their stones for reuse, preserving a 112-year-old dormitory “as a stabilized ruin,” constructing 344 condominiums for the 55 and older crowd, and designing 17 acres of public outdoor space. Staten Island’s renaissance continues to move full steam ahead as the Landmarks Preservation Commission has unanimously approved the rehab of the long-abandoned poorhouse and farm located on the oft forgotten borough. 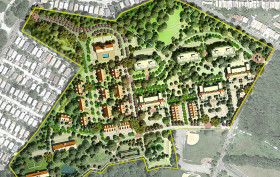 Curbed reports that the New York City Farm Colony will be redeveloped into 350 units of senior housing with some retail space in a new eco-minded project called ‘Landmark Colony’. 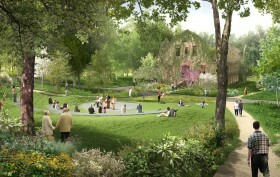 The plan, which is being spearheaded by NFC Associates in cooperation with the New York City Economic Development Corporation and Vengoechea + Boyland Architecture was lauded for its site-sensitive design and ample green space.